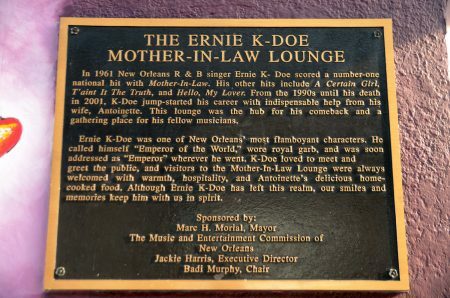 From 1995 until 2010, Ernie K-Doe’s Mother-In-Law Lounge served as a music venue, community center, and shrine to singer Ernie K-Doe, the self-styled “Emperor of the Universe.” K-Doe was known for his song “Mother in Law,” a national No. 1 hit in 1961. 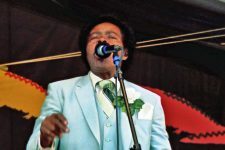 A dynamic performer, K-Doe toured widely and recorded numerous other regional favorites in the 1960s. 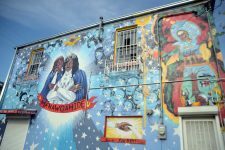 In the 1980s, as a DJ on community radio station WWOZ, he became known for outlandish, stream-of-consciousness rants. 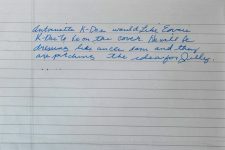 K-Doe had fallen on hard times by the 1990s, but a bartender named Antoinette Fox helped him get back on his feet and open the lounge. The couple married and lived on the second floor. The first floor displayed memorabilia from K-Doe’s career and included a performance space where he jump-started a revival. Often accompanied on keyboard by Rico Watts, K-Doe played to a diverse crowd. 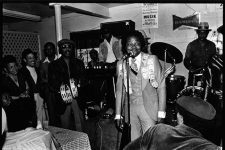 Veterans of the city’s black R&B scene mingled with younger, predominantly white rock and experimental musicians. The K-Does embraced all comers: Murals on the building’s exterior featured local artists from Quintron and Miss Pussycat, known for “Swamp Tech” dance music, to Mardi Gras Indian Chief Allison “Tootie” Montana, who masked along this stretch of North Claiborne Avenue. 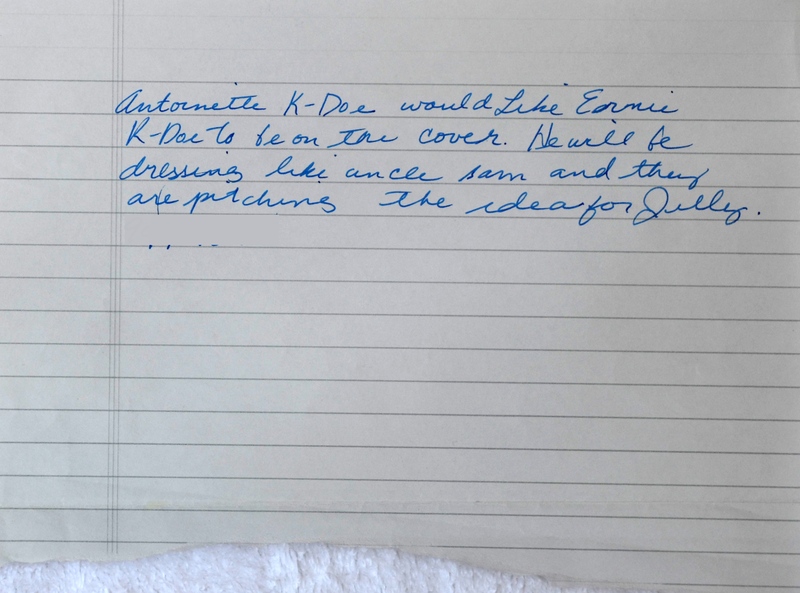 After K-Doe’s death in 2001, Antoinette celebrated her husband’s legacy with the help of a lifelike statue of K-Doe fashioned from a mannequin, which she dressed in his suits and jewelry. The flood caused by levee failures during Hurricane Katrina inundated the lounge, though Antoinette reopened the following year, using the facility to feed returning neighbors and visiting volunteers. 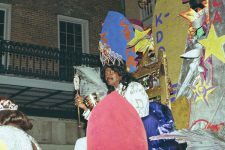 On Mardi Gras mornings, in keeping with a Carnival tradition, she led a walking parade of women dressed as baby dolls from the lounge. 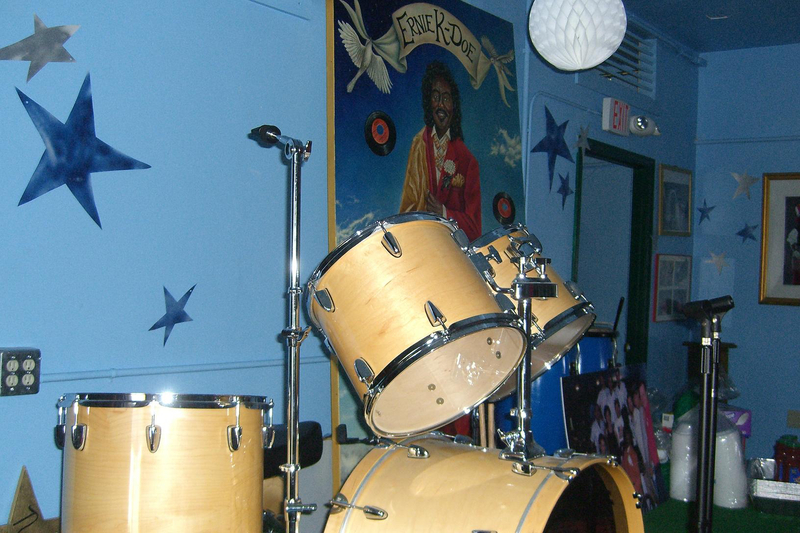 Antoinette died on Fat Tuesday 2009, and the lounge closed in 2010. 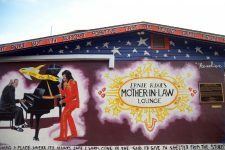 In 2014, New Orleans trumpeter Kermit Ruffins reopened the club under the name Kermit Ruffins’ Treme Mother-in-Law Lounge. Ruffins has been known to feed patrons from a grill he tends in the back of a truck parked outside. 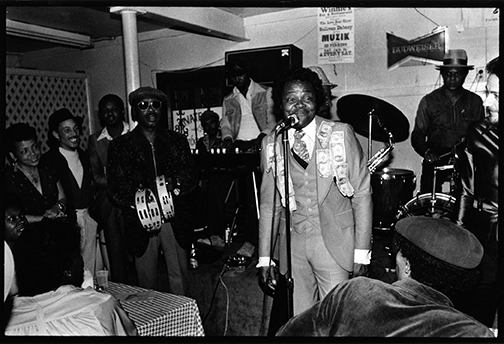 Ernie K-Doe and band perform "T'aint It the Truth" at Winnie's in New Orleans in 1982, shot by Alan Lomax and crew. 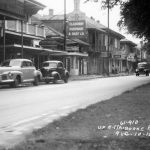 Video posted by Alan Lomax Archive. Further reading at cultural equity.org. 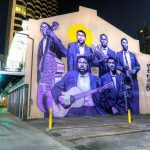 The official Louisiana Music Hall Of Fame Induction video for Ernie K-Doe, including footage of a Jazz Fest performance and his appearance with Antoinette in the movie Happy, Now & Then. Ernie K-Doe in action at his Mother-in-Law Lounge with The Egg Yolk Jubilee, April 27th, 2001. An interview with Mother-in-Law Lounge proprietor Antoinette K-Doe from 2008, three years after Hurricane Katrina and the catastrophic levee failures. Video posted by Mike Errico. 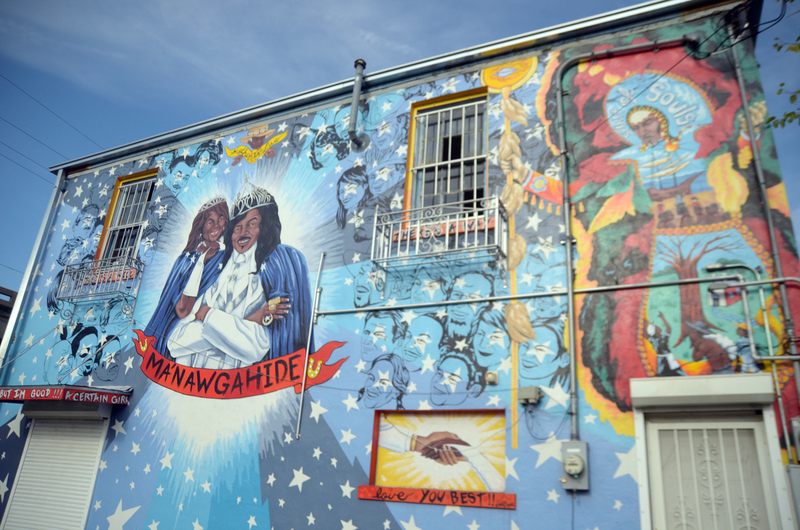 Artist Daniel Fuselier painted several murals on the Lounge, each covering his previous work. 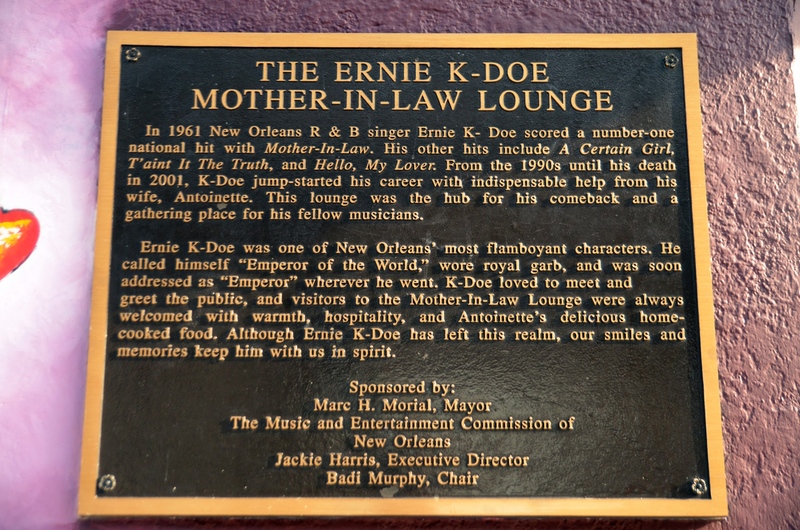 This iteration depicts K-Doe’s collaboration with Allen Toussaint, who wrote the hit that gave the Lounge its name. © Aubrey Edwards. Photo by Aubrey Edwards. 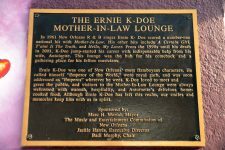 Plaque on Ernie K-Doe’s Mother in Law Lounge. ©The Historic New Orleans Collection, 2007.0103.4.854	Photo by Michael P. Smith. 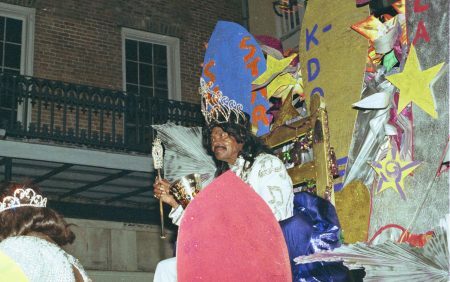 From 1996: Mr. Manaugahyde himself, a real bad motorscooter, Ernie K-Doe. Ernie K-Doe reigning as king of the Krewe du Vieux Mardi Gras parade in 2001. Wikimedia Commons. Photo by Derek Bridges. Artist Daniel Fuselier painted several murals on the Lounge, each covering his previous work. 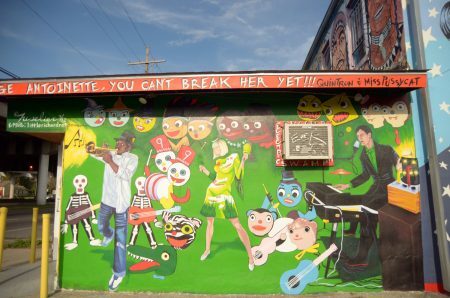 This iteration, in 2013, features Quintron and Miss Pussycat, artists who were close to the K-Does. 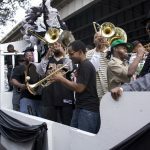 Kermit Ruffins, who took ownership of the club after Antoinette K-Doe’s passing, plays trumpet at left. © Aubrey Edwards	Photo by Aubrey Edwards. Artist Daniel Fuselier painted several murals on the Lounge, each covering his previous work. This iteration, in 2013, features Ernie K-Doe as the Emperor of the Universe with a Mardi Gras Indian to the right. Drum kit on the bandstand in the Lounge in 2006. 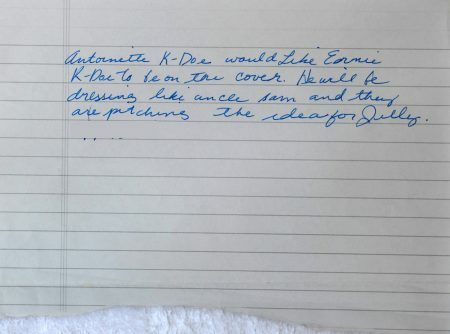 A portrait of Ernie K-Doe hangs in the background. 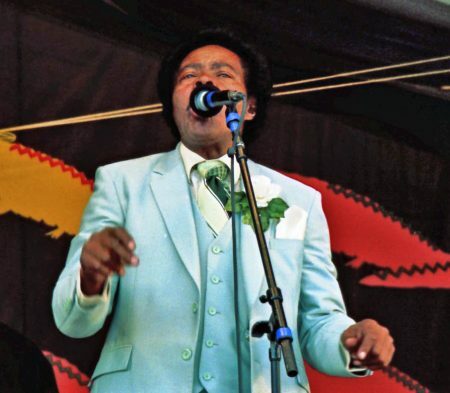 Ernie K-Doe on WWOZ, "It's a pleasure for you to listen to me"
Ernie K-Doe on WWOZ, "I'm gonna play what I wanna play"